Mixing literary with the fashionable may seem to be an odd couple. 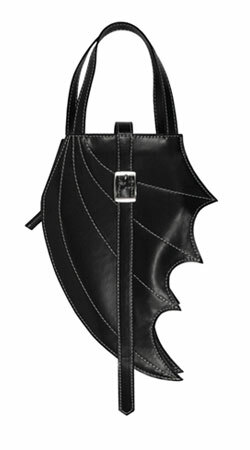 One does not often think Edgar Allen Poe and a Purse, or Jane Eyre and chic. Dorothy Parker was a woman of dark wit and quite a stylish sense of fashion. She never failed to match irony with sarcasm. Caitlin Phillips of Rebound Designs has salvaged unloved vintage books of great prose and given them new life fashionable handbags. She takes the covers and bonds them with coordinating fabrics, beads and hardware to create brainy bijoux. Are the words lost inside? No. She takes titillating passage and creates brooches as well. Looking for a Steampunk party in North Carolina? Take yourself down to Chapel Hill for a night of dancing and music for "Pilots of Airships and their Crews, Mad Scientists, Explorers of the Unknown, Admirers of Verbosity, Respecters of the Strange, Those Lost in the Throes of Opium or Absinthe, Teetotalers, Scallywags, Ladies and Gentlemen, Dandies, Fops, and Urchins..."
The event is produced by the dandies of the Clockwork Cabaret and takes place March 6, 2010. If you saw my Anti-Valentine guide posts in the past few weeks, you might think that I am not a romantic. You are wrong, for I love a passionate dark romance. Unfortunately the feedback on this film was beastly. Was it the performances? The direction? It certainly was not for lack of style. The costumes by Milena Canonero (Marie Antoinette) were meticulous and set a deliciously dark tone to the Victorian setting. Benicio Del Toro's flamboyant fur coat hints at his forward animal nature in a sea of conservative gentleman. Anthony Hopkins wears a patterned silk cravat and tie indicating a classic, sophisticated upbringing. However the soft, unstructured shoulders indicate a softer, perhaps tired soul. Emily Blunt's character, the fiancee of Lawrence Talbot (aka The Wolfan) wears formal, structured silhouettes. However the dark colors and curved lines frame her face and body for strong femininity. Photos courtesy of Clothes on Film by Chris Laverty. A fantastic site about costume design in movies. 1Alas, one of the toughest things about being a fashionable Gothic Diva, is the toll it takes on your purse. 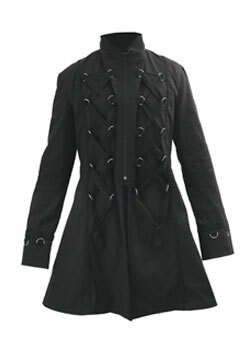 The delicate details that make Gothic fashion so special is also what drives the prices up. Let's face it, a simple t-shirt does not take much effort to make, but laced up, tailored, sculpted corset seams and hardware CAN make everything expensive. What a nice surprise to find an online boutique that sells intricately designed pieces that had nice fabrics, great style AND came into price points most people could afford? Rivithead's clothing, footwear and accessories for both women AND men ranged from extreme punk to Gothic-tinged styles you might be able to get away with at the office. Has your dating pool become stale? Are the local humans just not appealing to you? Find your inner Bella or Sookie Stackhouse and expand your horizons! 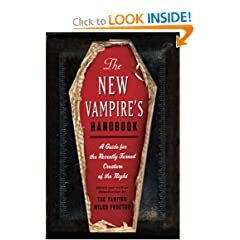 Now, if you are successful, and your bloodsucker is so infatuated with you that he is willing to make a commitment, then you will need The New Vampire's Handbook . (On sale for $11.20) This tongue-in-cheek (or 'fang-in-neck") guide offers helpful information on navigating your new undead body and the powers that come along with it. Socially, there are good tips for blending with the masses, acting your age and how to deal with the media. Very relevant indeed! It might not be fair to call this one anti-Valentine. For many of you, a tour through 5000 square feet of themed, horror filled rooms in a first class haunted house is the perfect date. Blood Manor has been one of NYC's top haunted attractions for the past few years. On Friday, February 12th, 2010, the event will pay special tribute to the movie opening of "Wolfman" with giveaways, movie passes, and other surprises. Saturday will include special Valentine's gift as well. Admission is $25 normally, but if you go through the Madame's guest list, buy tickets half off! Dramatic feathered headdresses seemed to be the accessory for the start of 2010. Might this be the start of Bird-fetish Goth? Abbey Lee Kershaw sports several variations in her photo spread by Miguel Reveriego in Numero Magazine #109. Jennifer Lopez has a glamorous noir shoot, but less interesting with her big feathered hat in Allure magazine this month. Photo by Michael Thompson. Jean Paul Gaultier's recent couture show for Spring 2010 was a fabulous display of flamboyant headdresses, sculptured tresses and stunning gowns.